That former Prime Minister Ferenc Gyurcsány, founder of the Democratic Coalition, not appear on a joint opposition party list. Mr. Botka was adamant that Mr. Gyurcsány is so compromised and disliked in Hungarian society, that his presence on any joint list would turn off voters. In the last couple of weeks, it became clear that there was no chance of a joint opposition list, nor would Mr. Gyurcsány take a step back. Just this past weekend, the Politics Can Be Different (LMP) green party, which has seen a slight uptick in support, confirmed their own nominee for prime minister, namely Bernadett Szél, and announced their own program. Of the small parties, LMP–which appeals to younger voters and undecided voters who generally have no history of voting for either MSZP or DK–would have been the most important for Mr. Botka to get on board, and these efforts failed. In June, I attended a private picnic in Budapest organized in the home of a Hungarian publisher with close ties to MSZP. Mr. Botka was present, as were several other MSZP politicians, former ministers, left-leaning journalists and pro-MSZP cultural figures. Mr. Botka took questions from this high-profile audience of around 40 people and I could sense a degree of tension. People were concerned about Mr. Botka’s choice of messaging, which included a populist left-wing turn that spoke of taxing the wealthy. While that might not shock socialists or left-wingers in other countries, Hungary’s left-wing rhetoric has been very tame and centrist in comparison, for at least the past 15 years. I know that many were not comfortable with this rhetoric and suggested that MSZP should instead focus on a staunchly pro-European Union message in its campaign. There is also talk of a coup against Mr. Botka within MSZP, involving a potential independent candidate–Tamás Lattmann–who had earlier on expressed interest in being the prime ministerial nominee for the left. Mr. Lattmann, a 41 year old legal expert and academic, claimed that he had the support of key leaders within MSZP and specifically named MP and a leading socialist Zsolt Molnár as a supporter. We know that Mr. Molnár and Mr. Botka had a rocky relationship. 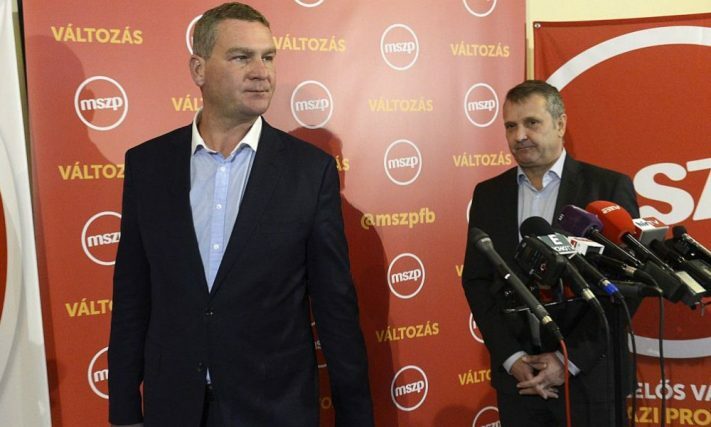 This past summer, Mr. Botka accused Mr. Zsolt Molnár in public of being a “traitor.” Party chairman Gyula Molnár did little to investigate this conflict. Late last week, Mr. Lattmann aligned himself with Mr. Molnár’s expert on public security policy, Péter Tarjányi, apparently with the aim of removing Mr. Botka. Mr. Botka hardly departed quietly and his departure was followed by public acrimony among socialists. “I erred, because I underestimated how conniving Fidesz actually is and I also did not realize how effectively the political mafia had encircled the democratic opposition, including my own party, unfortunately,” declared Mr. Botka. He then charged that DK and the other small parties were only concerned with passing the 5% threshold for parliamentary representation and had given up on defeating Viktor Orbán. “All they want is to secure a couple of places in the parliamentary benches of the Orbán regime”, said Mr. Botka. Jobbik was quick to capitalize on the opportunity presented by the public implosion of MSZP. “MSZP has now officially stopped being the leading power on the left. The socialists are on the precipice of total collapse”–said Dóra Dúró of Jobbik. And Ms. Dúró is probably right. MSZP has nobody in mind to run as its nominee for prime minister and it is likely that Jobbik will be able to break off a larger chunk of the traditional socialist base in small town Hungary. Seven months before the 2018 elections, the democratic opposition is in significantly worse shape than it was in the months before the 2014 election. MSZP is adrift and occupied with internal feuds. DK stagnates at around 5% and cannot draw in new voters, except a handful from MSZP. Együtt continues to push for a New Left alliance that none of its potential partners are interested in. LMP had decided that it will go it alone and Momentum–stuck at 2% and with almost no money–won’t even hear of cooperating with anyone. Not at all surprising, not at all bad. Perhaps this catharsis will be the wake-up call to the democratic opposition, that you cannot build a winning coalition, if you cannot build a national base, without a permanent national network, without permanent, visible and active local representation in every riding. Momentum is perhaps the best, or most recent example of the Hungarian political elite’s infantilism, its inability to master the fundamental rules of mass politics. Every single political Party, except the ruling Fidesz, is Budapest centered. They all lack a national grid, and a permanent, institutionalized base of activists at riding levels. The yuppies who created Momentum, along with the left-liberal establishment believe, that it is sufficient to visit the countryside (országjárás) during the campaigns, that there is no need for “permanent boots on the ground” in the small towns and villages, where officialdom is firmly in the hands of Fidesz, and where economic survival is almost entirely dependent on the good will of Fidesz authorities. It is this ineptitude, this inability to work for the trust and support of ordinary Hungarians at riding levels, that keeps the Mafia-State alive. The Hungarian democratic opposition has no one to blame but itself. However the event has a silver lining. Dep.Chairman Tamàs Harangozo and the PR officer of the party also resigned. Chairman Molnar announced that he will head the group to negotiate with the other dem parties. A more cooperative approach and better PR work are likely. According to the results of the Publicus poll, published yesterday, 40% of the population is politically undecided. Normally this would be fertile ground for any opposition party, especially in a place like Hungary where people have good reason to conceal their voting intentions or mislead pollsters. Yet not a single opposition party has capitalized on this so far. What a wasted opportunity. How pathetic. The basic problem they have is that the basic goal of “the democratic opposition” is not so democratic at all. Hungarian voters would be eager to live in a trully democratic society and very willing to support it. They only hear the slogan of “democracy”. They are strictly under party rule. That was, is, the present system. That is all they know. So what’s the hope ?